Carter Uncut brings New York City’s latest development news under the critical eye of resident architecture critic Carter B. Horsley. Here, Carter brings us his sixth installment of “Skyline Wars,” a series that examines the explosive and unprecedented supertall phenomenon that is transforming the city’s silhouette. 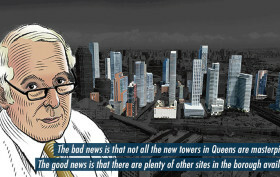 In this post Carter looks at the new towers defining the Queens skyline. For a long time, the glass tower erected by Citibank was the lone skyscraper of note in Queens. Known initially as Citicorp at Court Square, it was built in 1989 and designed by Raul de Armas of SOM as a blue-green metal-panel-and-glass office tower with just a few setbacks at its 633-foot-high top—an extremely clean-cut, modern obelisk of fine proportions. The bank tower transformed “the landscape of New York” and “no longer does Manhattan virtually by itself control the skyline,” Mr. Goldberger continued. “Skyscrapers built at random all over New York would be devastating, but an occasional exclamation point, well designed and carefully placed, will do the skyline no grievous harm,” he concluded. This is a very important but also very controversial point as currently evidenced in Manhattan where traditional precincts are being pin-pricked to exhaustion and confusion by supertalls.